Dr. Thomas is a Senior Nuclear Medicine Resident and Dr. Singh is a Professor of Radiology and the Director, of the Division of Nuclear Medicine and PET Center at the University of Missouri Heath Care, Columbia, MO. Gastrointestinal stromal tumors (GISTs) are uncommon mesenchymal tumors of the gastrointestinal tract. These tumors are more common in older individuals but can occur at any age. Gastrointestinal stromal tumors are most common in the stomach but may occur anywhere in the gastrointestinal tract, omentum, or mesentery. Clinical presentation usually depends on tumor size. Small tumors are generally asymptomatic and are discovered incidentally at surgery. Large tumors usually produce symptoms, such as gastrointestinal bleeding, abdominal pain, abdominal mass, nausea, vomiting, and bowel obstruction. Computed tomography (CT) is commonly employed for localization and staging. 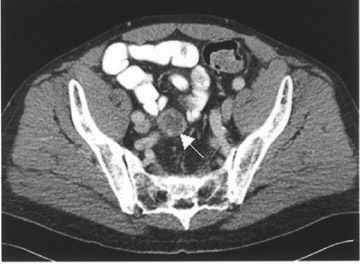 The typical CT findings are the presence of a large well-circumscribed mass arising from the stomach or small intestines that is usually extraluminal. The mass may have a heterogeneously enhancing soft-tissue rim surrounding a necrotic center. 1 Positron emission tomography (PET) using 18F-fluorodeoxyglucose (FDG) is a promising new imaging modality for GIST. A PET scan can show increased glucose metabolism, which appears to correlate with tumor viability. 2 In this report, we describe 4 cases of GIST in which FDG-PET played an important role in the management of patients with these tumors. The PET scans were useful in initial staging and in restaging the tumors and in predicting response to therapy. The patient did well, with marked improvement of his symptoms for 3 years until he presented with recurrence on the present admission. 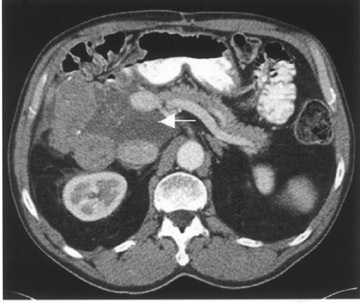 A CT scan of the ab-domen and pelvis exhibited a 10- × 7-cm right liver lobe mass and a 12-× 6-cm subhepatic mass (Figure 1). 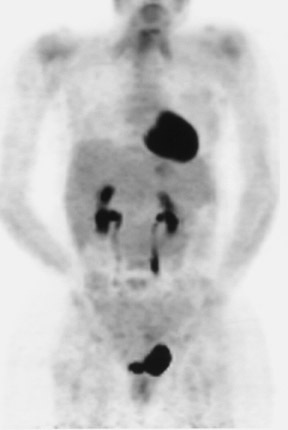 A necrotic pelvic lymph node measuring 3 × 3 cm was also noted on CT (Figure 1). A PET scan was done using 21 mCi of 18F- FDG and a dedicated scanner equipped with lutetium oxyorthosilicate (LSO) crystal (Siemens ACCEL, Siemens Medical Solutions, Malvern, PA). Whole-body images were acquired approximately 1 hour after injection. The PET scan showed markedly increased uptake in the liver and the subhepatic masses (Figure 1). There was no uptake in the pelvic region, excluding a pelvic lesion. The PET helped in accurate re-staging by indicating the malignant nature of the hepatic and subhepatic masses and excluding pelvic spread. A 42-year-old woman presented with dysphagia in October 2002. An upper gastrointestinal (GI) endoscopy revealed a benign-appearing stricture in the lower esophagus and an 8-cm tumor in the gastric wall. A partial gastrectomy was performed, and CD117 was identified in the resected mass. A postoperative CT scan was negative for residual disease. Imaging with FDG-PET was performed using the procedure described above for staging following surgery. Absence of uptake in the abdomen confirmed successful resection of the gastric mass and proved the benign nature of the esophageal stricture. A small focus of increased uptake was noted in the lower neck (Figure 2). 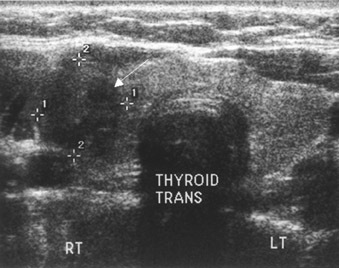 Ultrasound of the neck showed a 1.3-× 1.4-cm nodule in the right thyroid lobe correlating with the PET scan finding (Figure 2). Biopsy revealed papillary thyroid carcinoma. The patient underwent a total thyroidectomy and thyroid ablation therapy with radioactive iodine. 7.0 × 4.0 × 4.0 cm in the same area. On exploratory laparotomy, only part of the mass could be resected. On pathologic examination, most of the mass was found to be sclerosing mesenteritis with a small portion (1 cm) representing CD117-positive GIST. A PET scan performed postoperatively at an outside hospital was positive for residual disease. The patient underwent Gleevec therapy with an excellent clinical response. 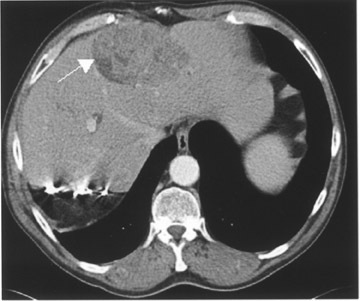 Six months later, a follow-up CT exhibited a residual tumor mass measuring approximately 5.6 × 4.0 cm that remained essentially unchanged despite Gleevec therapy (Figure 3). The larger, associated mesenteric density representing a mesenteric inflammatory mass was also unchanged in appearance. The CT scan was not helpful in evaluating the response to Gleevec therapy. A PET scan was done using 20 mCi of 18F-FDG. Whole-body images were obtained 1 hour after injection. The scan was normal (Figure 3), and the absence of FDG uptake correlated with the excellent clinical response and successful therapy for GIST. 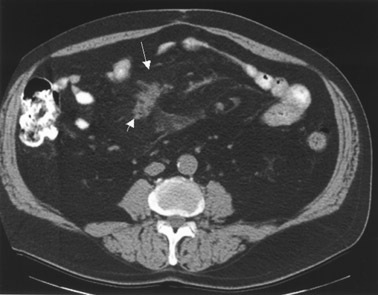 A 41-year-old woman presented with intense pain in the left lower abdominal quadrant. A pelvic ultrasound revealed pelvic masses that were suspicious for ovarian cancer. The patient had a total abdominal hysterectomy, bilateral salpingo-oophorectomy, and partial omentectomy. Pathologic examination of the removed ovarian masses showed CD117-positive GISTs rather than ovarian cancer. During laparotomy, large left upper and midabdominal omental masses were also noted that were unsuspected prior to laparotomy. These masses were asymptomatic but were unresectable. A PET scan performed 2 weeks after surgery showed markedly increased uptake in these masses (Figure 4). 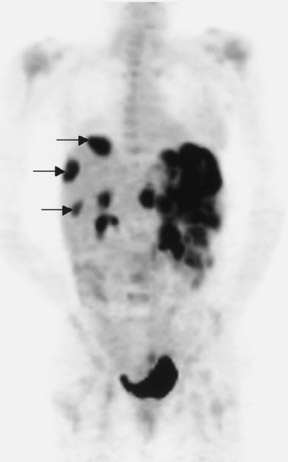 Three metastatic liver lesions were also noted on the PET scan (Figure 4). With proven diagnosis of GISTs, the patient was started on Gleevec therapy. 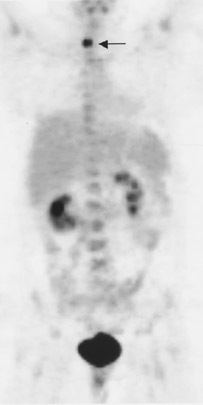 A PET scan performed 5 weeks after beginning therapy exhibited complete disappearance of FDG uptake in the abdominal and hepatic lesions (Figure 4), indicating excellent therapeutic response. Gastrointestinal stromal tumors are the most common mesenchymal tumors of the gastrointestinal tract (GIT). About 5000 to 6000 new cases of GISTs are diagnosed in the United States annually. 3 These tumors are KIT (CD117)-positive mesenchymal tumors of the GIT, omentum, and mesentery. KIT (CD117) antigen is the most important immuno- histochemical feature of a GIST and is very specific for the diagnosis of a GIST. 3 KIT is a tyrosine kinase receptor uniformly expressed in GISTs. Approximately 60% to 70% of GISTs are positive for CD34, 30% to 40% are positive for smooth muscle actin (SMA), and 5% are positive for S100 protein. Gastrointestinal stromal tumors can rarely be positive for desmin. Gastrointestinal stromal tumors are more common in older individuals (usually >50 years) but can occur in any age group, and both sexes are affected equally. 3 Gastrointestinal stromal tumors are most common in the stomach (50% to 60%), followed by small bowel (20% to 30%), large bowel (10%), esophagus (<5%), and elsewhere in the abdominal cavity (<5%). Tumor behavior varies with the site of origin, tumor size, and histological appearance. Poor prognostic indicators are advanced patient age, large tumor size (>5 cm), unresectability, presence of metastases, tumor necrosis, and high mitotic index. 3,4 Tumors of small-bowel origin tend to have more aggressive behavior and a worse prognosis than tumors originating in other gastrointestinal sites. 4 Mitotically inactive tumors can metastasize, and low mitotic count does not necessarily rule out malignant behavior. 3 Therefore, the present trend is to stay away from the term "benign" for any GIST, with the exception of very small (<1 cm) lesions found incidentally during abdominal surgery. Any GIST that is sufficiently large to produce clinical signs and symptoms can exhibit malignant behavior, including recurrence or metastases, following the initial treatment. Tumors found incidentally are usually small with a mean diameter of 1.5 cm and carry a better prognosis. 5 Generally, endoluminal tumors produce clinical symptoms earlier than do extraluminal tumors, increasing the chance of curative surgery. Generally, <50% of the primary localized GISTs relapse within the first 5 years of follow-up. 3 The incidence of metastases at first presentation of a malignant GIST is approximately 50%. 6 The liver is the most common site for metastases and recurrence. Less common locations of metastatic disease include the lungs, pleura, retroperitoneum, bone, and subcutaneous tissues close to the laparotomy incision. 1 Metastases to bone and the lung are uncommon. 6 Unlike other GIT tumors, lung metastases are uncommon with GISTs. Metastasis to the thyroid gland has not been reported. One of our patients had a lesion in the thyroid gland that was found to be an unrelated primary thyroid cancer. Complete surgical excision of the primary tumor is the primary treatment when complete resection is possible in the absence of metastatic disease. Because of the high rate of local and distant recurrence, adjuvant therapy is often indicated. Response to conventional chemotherapeutic agents and radiation therapy is disappointing. Early experience with the tyrosine kinase inhibitor, STI-571 (Gleevec, imatinib mesylate), has been extremely encouraging. This receptor tyrosine kinase inhibitor inhibits the activated KIT protein. This agent is now approved for the treatment of patients with KIT (CD117)-positive unresectable and/or metastatic malignant GISTs. The effectiveness of such treatment is clear from published studies; however, randomized controlled trials have yet to be completed to verify improvement in disease-related symptoms or increased survival. Clinical trials are now ongoing to evaluate the benefits of Gleevec on early stages of GISTs following surgical tumor removal. The advantage of PET lies in its ability to differentiate active tumor from a nonviable necrotic tumor mass, malignant from benign tissue, and recurrent tumor from scar tissue. The use of FDG-PET may improve our ability to accurately follow response to therapy in GIST patients treated with surgery, imatinib mesylate, and other treatment modalities. Though very promising, the number of patients in our experience and the number of published papers is too small to definitely assess sensitivity of PET and PET/CT in evaluating GIST response, as this malignancy is rare. A larger, multicenter study is required. Role of positron emission tomographic imaging in gastrointestinal stromal tumors. Appl Radiol.